Teaching Basic Concepts for Early School Success! Basic concepts are words that depict location (i.e., up/down), number (i.e., more/less), descriptions (i.e., big/little), time (i.e., old/young), and feelings (i.e., happy/sad). Children's understanding of basic concepts is important for early school success. These are usually taught outright to a child during his/her early years, and learned by listening to adults, following commands, and participating in reading activities. 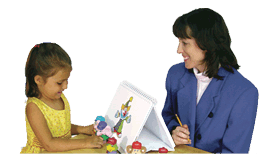 Understanding and using basic concepts help children learn to read and understand what they've read or written. They also help children become more effective communicators. Why are basic concepts important? There are four classifications of concepts. These are spatial (location), temporal (time), quantity (number), quality (description), and social-emotional (feelings). Generally, children learn marked concepts, or the concept with more distinctive attributes first. These include size, texture, quantity, emotional state, physical attributes, etc. For example, since the concept thick has more size than thin, it is the marked concept. Upon entering kindergarten, children should understand concepts as pairs, with the unmarked concept understood receptively and the marked concept understood receptively and expressively. Basic concepts help build pre-reading and early mathematics skills, strengthen a child's vocabulary, and are building blocks of early curriculum. What basic concepts should a child know? Listed below is a sampling of concepts a child should know between the ages of two and a half to five years of age. They are listed by order of age occurrence (i.e., the younger developing concepts are listed first). This list does not include all concepts and the concepts have a variety of age ranges for mastery. For example, the concept pair tall/short has an age range of 30-84 months for mastery. The above list does not include all concepts; it just presents a general list of concepts developing in the early childhood years. What can I do to teach my child concepts? Read to your child! A lot of common childhood books and stories teach early developing concepts. If the concepts are not stated directly within the text, the illustrations lend themselves to teaching a variety of concepts. As a parent or teacher, start by using an illustration and saying, for example, "Where is the cat? Its on the bed." Then, allow the children to tell you what is off the bed. As an extension activity, go around the room and find things that are on something and things that are off something. Play the game, "I Spy." Use the early developing concepts in your clues. You could say, "I spy something that is empty." For more practice, encourage the children to use concepts when it is their turn. This game is great to use one-on-one, as a group, or on long car trips. Using barrier games, give directions to the children using basic concepts. For example, you could say, "Color the big ball red and the little ball green." When the children are finished, the pictures should be exact. Allow the children to compare pictures and take turns telling each other what they did using basic concepts. For children who have difficulty understanding and using basic concepts, using real objects works best. Start with a box of objects and have the child follow directions with basic concepts. ("Put the spoon in the cup.") As the child progresses, allow him/her to tell you things to do using basic concepts. Remember, however, that a child must have a firm grasp of the concepts receptively before using them expressively. Basic concepts are building blocks to early school and reading success. Help a child learn these concepts by fostering his/her love of reading and playing games.